In The Dream of Europa, following the tradition of celebratory court masques in verse by Ben Jonson and more recently William Empson, Nicholas Hagger celebrates the court of the leaders of the European Union. 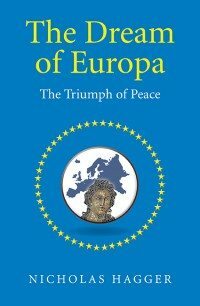 Through a chorus of 50 representatives of European states he presents the growth and expansion of what became the EU in an epic sweep that takes us from 1945 to 2015 and incorporates the five elements (prologue, antimasque, masque, revels, epilogue) and blend of mythology and history found in all masques. Zeus asks Europa, the goddess of Europe, to sort out the chaos and disorder that devastated Europe in 1945. Europa presides over the growing unification of a European Union of 28 states with 22 more expected to join. Celebratory revels acclaim the Treaty of Lisbon but there is a discordant note, and Churchill has strong words for the UK representative. Finally Europa hands the EU back to Zeus. The dream of Europa is that one day the EU will turn into a United States of Europe consisting of 50 states (see front cover) like the USA, and will bring in a Universalist World State. As a court entertainment for European leaders celebrating Europe’s progress from disorder to order, The Dream of Europa cries out to be performed in Brussels. It heralds the triumph of peace during the 70 years following 1945 and calls for a strengthening of European unity in the face of an expanding Russia that still regards Eastern Europe as being within its sphere of influence. This masque and its informative appendix on European states and rights will appeal to all generations in the 50 European states and to all beyond who value a peaceful Europe in our troubled time. Hagger’s poetic masque is in the tradition of the early 17th-century court masques of Ben Jonson. In a new approach he adapts the national, English masque to celebrating the origin and growth of what is now the European Union.